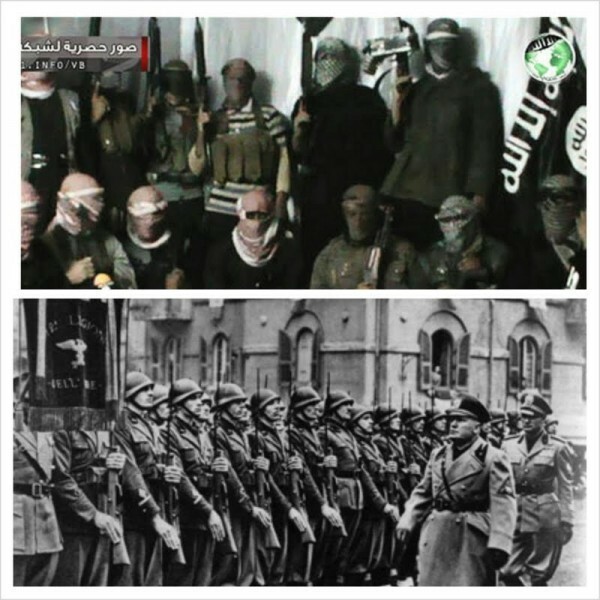 Get past the headlines, the symbols and sound bites and you find striking similarities between the extremist ideologies of 1930’s European Fascism, and today’s Jihadist interpretation of Islam. Like Mussolini’s volunteers, Hitler’s SS, and Mosley’s Blackshirts, today’s Islamists revel in the mythology of struggle, and venerate the warriors of their cause. The very act of fighting itself takes on a significance beyond the immediate bloodshed. For both sets of extremists, the fallen are lionised and held up as an example to others. Another unpleasant similarity between fascists and Islamists is that neither are especially concerned with civilian casualties. Despite toting themselves as the ideology of a brave new world, fascism pulled heavily on the established societal and family structure. Authority was to be respected, with those who strayed being punished severely. Morality and devotion to the fatherland, through the State, was essential if the collective was to survive and prosper. Equally, today’s Islamists demand a moral uprightness and strict devotion to a faith, a faith whose authority over all things can never be questioned. Under Islamism, society turns the clock back to a time when everybody knew their place, and knew better than to deviate from societal norms. All, of course, for the greater good. European fascism manifested itself in many unpleasant ways. But the ethnocentric aspects of its ideology led to its most brutal crimes. Fascism rejected individualism, emphasising instead the unity of the group, or race. It mattered not what your class or upbringing was; all that mattered was your genetic heritage. In the fascist warped world view, once ‘its people’ were unified, the energies of the collective could be marshaled by the state to vanquishing its enemies. Unsurprisingly, mixing of the races was an abhorrence. Today, Islamists reject national labels for followers of Islam, instead insisting that they are Muslim and nothing else. To reinforce this absolutist view, outsiders are lumped together in shapeless, faceless masses, so as better to frighten followers into unity. And just as fascists demanded racial purity, Islam insists on religious purity. Marrying outside the faith, even having a social life outside the faith, is a betrayal of the collective. With its black shirts, military style ranks, and extolling of virtues of sacrifice, fascism stood at juxtaposition to the individualism, wasteful flamboyance and excess of the democracies it so despised. The fascist would strive for a Spartan, humble existence, with all excess energy devoted to the fatherland and the cause. By comparison, the Islamist recoils at the promiscuity, immorality and decadence of the modern world. Drinking, smoking, drug taking, taking multiple sexual partners, are all signs of decay, or more accurately, a disease, that could all too easily infect Muslims if the Islamists waver in their struggle. For both, greed and consumption are rejected in favour of collectivist ownership under the state. A common theme among fascists of yesteryear was a desire to see global balance of power revised. In their view, the tired, decadent powers of Britain and France were finished and the world needed new masters. Most fascists sought a return to a previous goldern era. For Mussolini, it was rebuilding the might and majesty of the Roman Empire. For Hitler, it was uniting the Germanic peoples and ‘reclaiming’ the lands to the East in another glorious crusade against the Slav. Islamists today have no less radical geopolitical designs. Not only does the hyper power of the United States need to be hobbled, but the Islamic world needs to be united under a single Caliphate. An Islamic Empire stretching from the Atlantic to Western China would have the strength and unity to resist the barbarism and sin of the outside world, and provide the resources for eventually uniting the globe under a single flag. The fascist family was a traditional one. The men worked or served in the military, and the woman stayed in the home. Her duty was domestic, and primarily to produce and raise children for the armies of the fatherland. Nature had decreed that women here there to be mothers and wives, not people in their own right. Islamists take this lazy sexism and crank it up to ten. Not only should women not be working, they shouldn’t even go to school. Not only that, they shouldn’t be seen in public, lest they distract and tempt the men folk. In 1934, a special division of the Gestapo was instituted to compile lists of gay individuals. In 1936, Himmler created the “Reich Central Office for the Combating of Homosexuality and Abortion”. Hundreds of European gay men living under Nazi occupation were castrated under court order. In Islamist Afghanistan, suspected homosexuals were often buried alive by the Taliban. Fascism was obsessed with death. Western culture was in terminal decline after the Great War, and the Western democracies were reliving the last days of Rome; hedonism and enfeebled naval gazing. Fascism was the ideology of force, of action. Ideas of momentum and force of will feature heavily in its literature. Fascism was a rejection of intellectual discourse and debate, preferring the dynamism and animal impulses of the wild. In such a world, ideas of compromise and flexibility were discarded as weak and even effeminate. Political negotiations were only ever a ruse to by time. Treaties were honoured only so long as they were useful. Talking with your enemies with any sincerity, with a desire to see a compromise, would never enter the imagination. With today’s Islamists, the idea of a compromise with Israel or ‘the West’ is equally unthinkable. In the mind of the Islamists, outsiders are hell bend on Islam’s destruction. Accordingly, Islam must conquer or be conquered. There will be no peace until one side is utterly vanquished. Britain resisted fascism because we didn’t try to fight fire with fire. After all, it wasn’t communism that defeated British fascism. Instead, we defeated fascism reminding ourselves what we stood for; tolerance, calmness, being a bit boring, restraint, and yes, even a little humour. Communism, fascism and Islamism will never find fertile ground in Britain because they take themselves far too seriously…and Brits don’t take anything seriously. The Death of Our ‘Grand Narrative’: Where are We Going?